While the crypto market, as measured by total market capitalization, further declined in Q3 2018, we have witnessed some signs of stabilization in the second half of September. 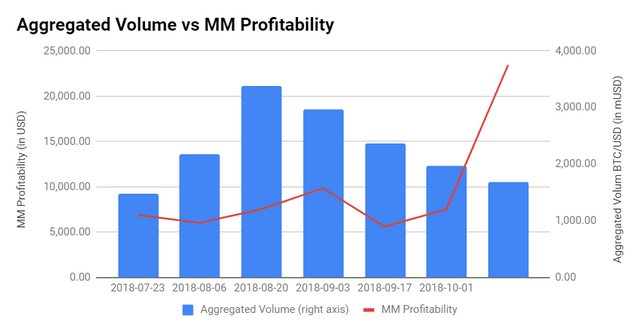 Liquidity remained low through the quarter and only some positive news related to individual crypto assets caused an increase in trading volumes of these individual coins in last weeks of the quarter (spike in XRP price). AI Trading Bot has been launched and its functionality and additional features are still being implemented. Our market making team has successfully completed migration to new trading algorithm. As already communicated this new algorithm makes extending our activities to new markets much faster and we have added 4 new exchanges in our market making pool. Our objective for end of 2018 is to have 20 exchanges included in market making algorithm. We have experienced some setbacks in market making bot automatization and it still mostly supervised – here security and robustness are crucial and we cannot leave anything to chance. As already mentioned, we are in final stages in launching the new platform that will allow you to invest your funds in additional investment products, such Crypto Baskets (CBx) allowing for easy diversification in the cryptocurrencies. Furthermore, along with migration to new platform, XRL token will also experience complete transformation – more information will follow through our standard communication channels. At the beginning of Q3 2018, market capitalization of all of the cryptocurrencies stood at 260 billion USD. In the first month of the quarter some optimism returned to crypto markets and by August market capitalization reached 300 billion USD. During August bears returned and market capitalization decreased approximately 30%, to below 200 billion USD. From mid-August to the end of the quarter cryptos were trading in relatively tight range from 190 to 240 billion USD. At the end of the quarter market capitalization of cryptocurrencies was 220 billion USD, which is approximately 18% less then at the beginning of quarter. Founders Bank will be the first decentralized bank in the world belonging to the cryptocurrency community. All token holders will be considered owners of the organization. American regulators have given Coinbase the go-ahead to list tokens as securities. To do so, the company will acquire several dealers that work with securities and create new business units. The Financial Innovation Bureau will be responsible for “new developments and challenges such as cryptocurrencies,” and will regulate the fintech sector. On July 25 the average daily trading volume of bitcoin futures on the Chicago commodities exchange (CME Group) equaled 12,878 contracts. This is an all-time record. Constantinople will be the second stage of the Metropolis hard fork and is expected to improve the performance and lower transaction fees on the Ethereum network. It was also confirmed today that its activation will take place at the Devcon4 conference, which will take place from October 30 to November 2 in Prague. There will be a bitcoin ETF, only later: the American regulator has postponed the consideration of applications from two New York-based companies. Sources had previously said that the application would probably be approved. ICOs and cryptocurrency trading are already banned in China. Now the authorities have started blocking websites: the country’s regulator found 124 trading platforms being used by citizens and announced that it would block access to them in the near future. The ban has partially come into force — several forums on digital assets have already been blocked. However, information on certain cryptocurrencies is still available. The credit institution intends to concentrate in the coming years on researching innovations in cloud-computing, big data, artificial intelligence, blockchain, and the Internet of Things. The market launched trading in bitcoin exchange-traded notes tied to the US dollar in August. Prior to this they were only available in euros or Swedish krona. Over the month participants were unable to make sense of the products, and now trading has been suspended. The fall of Ethereum was strongly influenced by the actions of ICO projects, believe researchers at Trustnodes. Over the past 30 days, startups have sold three times more coins than they did last month. The Commission is supposed to approve, disapprove, or institute proceedings on the issue of bitcoin ETFs by September 30. The SEC has chosen the last option, meaning that the new instrument will almost certainly not appear on the market before the end of the year. Dubai has transferred all payments between state departments and banks to blockchain. The decentralization will save time: right now one transaction can take up to 45 days. Clamorous discussions of bans on cryptocurrency advertising and ICOs are fading away on major media platforms. Following Facebook’s lead, Google has also decided to lift the ban. Granted, only in Japan and the US. Coinbase plans to expand the list of coins it trades and to add all assets that meet its rules and legislative requirements. A tool for submitting listing applications has appeared on the site. In the next table, we can observe the price change for the 10 largest cryptocurrencies by their market capitalization. Although majority of cryptocurrencies experienced decrease in price, prices of Ripple and Stellar increased significantly, while BTC was almost unchanged. By end of Q3 2018, RIALTO.AI performed market-making activities on 12 exchanges, on two fiat currencies (USD, EUR) and 11 cryptocurrencies: Bitcoin (BTC), Ethereum (ETH), Ripple (XRP), Litecoin (LTC), DASH, Monero (XMR), EOS, Bitcoin Gold (BTG), Zcash (ZEC), Bitcoin Cash (BCH) and Tether (USDT). Compared to end of previous quarter we have increased the number of exchanges by 50%, and we have also added USDT. Total number of trades in Q3 2018 was 54,462 - 31,028 trades occurred performing market making and 23,434 while hedging those trades. Most traded currency pairs in Q3 are presented below. 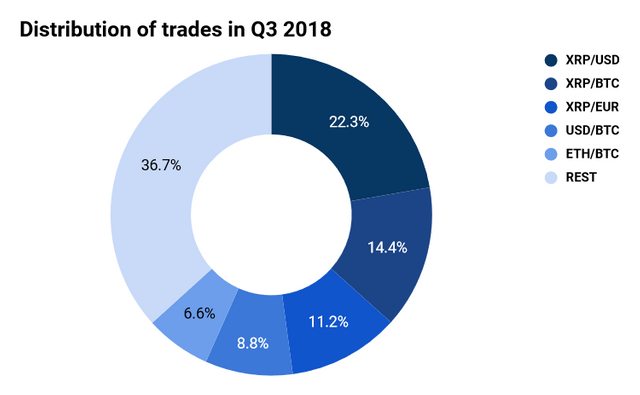 Compared to Q2 2018 number of trades increased by 35%, while number of market making trades almost doubled. The increase in the number of trades was result of more aggressive quoting and spreads decreased, resulting in decreased profitability. In this quarter trading was more concentrated compared to previous quarter – major cryptocurrency was XRP against BTC and fiat. The key reason is increased XRP volatility in the last trading period of the quarter. The last trading period of the quarter stands out and almost 50% of all the market making trades were performed then. ETH/BTC – highest trading cryptocurrency pair in the previous quarter – was only fifth. As mentioned before, more aggressive quoting was a reason for lower profit per trade, which caused decrease in overall profitability. The average profitability per trade of USD 2,92 was reached. Profit per trading period was relatively stable at around eight thousand USD, while in the last trading period it was almost tripple that. Absolute profit reached in this quarter (including trading period starting on June 26, 2018) was USD 66,799.92. Next table shows profit of market-making operations in relation to the value of Digital Asset Pool (DAP) used for trading in this quarter. A simple projection is also calculated to annualize the data. Profitability of market-making operations decreased slightly in Q3. While in the Q1 2018 the projected annualized profitability of DAP reached almost 18%, 10% in Q2, we have seen some stabilization in the Q3, decreasing only slightly to roughly 8%. As mentioned, decreased liquidity and volatility are the key reasons for decreasing profitability. In the next chart, we can observe aggregated BTC volume vs market making profitability. In early weeks of quarter, we can see the correlation between BTC volume and profitability. In the last part of quarter, correlation cannot be observed, since profitability increased due to increase trading in XRP. DAP, deployed by market making, consisted of all the cryptocurrencies and fiat currencies, used in trading (USD, EUR, Bitcoin (BTC), Ethereum (ETH), Ripple (XRP), Litecoin (LTC), DASH, Monero (XMR), EOS, Bitcoin Gold (BTG), Zcash (ZEC) and Bitcoin Cash (BCH)). 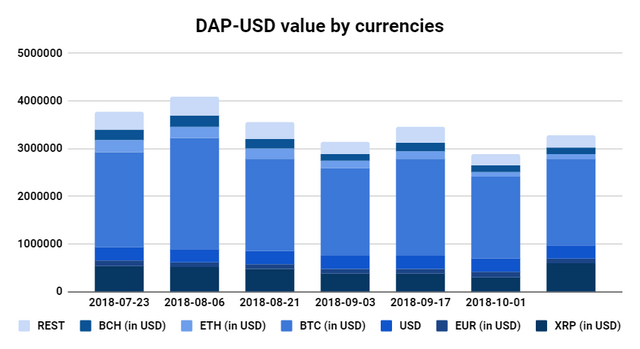 Again, the falling prices of individual cryptocurrencies compared to USD caused the total DAP to decrease in value. From December 1, 2017 to September 30, 2018, trade bot achieved minus 2.33 percent return running four long-only strategies and three long/short strategies. In the same time period, Bitcoin return was minus 33 percent while Ethereum dropped 46 percent. In 3Q 2018, our trading bot made minus 1.14 percent compared to Bitcoin price change of plus 4 percent while Ethereum lost 49 percent of its value. The maximum drawdown in our portfolio amounted to 5.74 percent, while Bitcoin in its choppy market recorded largest drop by 27 percent in the same time period. Ethereum on the other hand was in steady downtrend and maximum drawdown amounted slightly over 50 percent. During the third quarter, we also increased utilization rate of our portfolio to 1.100.000 USD. Trading algorithms are still applied on the largest and most liquid cryptocurrencies. In 3Q18 we also started with development of trading indicators by which profitability of trading systems could be improved further. With regard to our market making activities, we expect to extend our trading to 20 exchanges by end of the year. By end of the year, we are also planning to be able to run market-making bot on continuous basis. We are certain, that extending our activities to new markets and extending the uptime will result in increased profitability of our market making bot. In September we took the first steps towards a solely AI-based trading bot. Using machine learning techniques, a real-time AI bot will be developed purely with in-house knowledge. This bot will anticipate the market in advance, decide when to invest and when not to using the qualitative and quantitative knowledge and data on which it was trained on and will make these decisions, unlike real human traders, emotionlessly, tirelessly and most efficient. Our users will also have the option to expose their assets to another algorithm with different risk profile. Updates in our proprietary multi-strategy back-testing environment should be finished until the end of the year. As mentioned beforehand, the new platform is expected to be launched in next couple of weeks – the platform will users to invest in the existing products – market making and AI trading bot – as well as some new products, such as passive investment product, CBx – Crypto Baskets of various crypto currencies, that will allow for easy diversification, either among top crypto currencies or just in some specific segments of the crypto market. This document is merely a presentation of RIALTO.AI project development and is not legally binding in any way or form. Any documentation, technologies or products RIALTO.AI provides do not in any way or mean represent an investment consulting or other investment activities. RIALTO.AI is an IT company, developing complex algorithms for its users. RIALTO.AI is not liable for any possible deviations from developed technology or projections in this document on crypto currency markets. RIALTO.AI is not responsible for any possible damages arising from misinterpretation or poor interpretation of this or other RIALTO.AI documents. RIALTO.AI is not liable for any losses that may occur from using its products and does not in any way guarantee for profits. Algorithms and other RIALTO.AI products are in constant development and are not flawless. Use of RIALTO.AI products represent a certain level of risk due to (1) third-party exchanges, (2) legal risks, (3) blockchain technology, (4) theft, hacking and other loss, (5) transmission risks, (6) development failure, (7) cryptocurrency markets, (8) other anticipated risks, for which RIALTO.AI holds no liability. All Products are used at sole discretion of its users who are aware of the potential risks. The content and images of this paper are protected by copyright. Any unauthorized use, public distribution, reproduction, alteration and/or transmission in any form or by any means, without the prior written permission of RIALTO.AI, except in the case of brief quotations embodied in critical reviews and certain other noncommercial uses permitted by copyright law. Research findings and Developed economic projections in this paper are result of comprehensive and in-depth analysis of relevant economic factors of the RIALTO.AI team. If you haven't joined our project yet you can register at www.rialto.ai and to learn more about us please visit our Medium blog. To stay up to date with our project, please subscribe to our newsletter and follow us on our social media channels linked below.